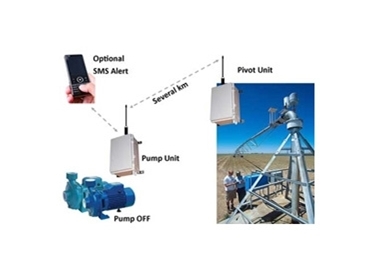 Agrigator wireless irrigation monitoring systems from Orbit Communications effectively monitor pivot or lateral irrigators and then send appropriate information back to the relevant water pumps via wireless link. If the irrigation monitoring systems detect a problem at the pivot irrigator they work efficiently to immediately switch the appropriate water pumps off and prevent them from operating until the problem is resolved. The irrigation monitoring systems are also available with a GSM/Next-G dialler. This optional extra operates by sending an SMS to a maximum of five mobile telephone numbers, which alerts alerting farmers or property maintenace staff of the issue. For maximum reliability, the GSM/Next-G dialler is equipped with a high gain antenna to ensure SMS messages can be sent even in weak signal areas. Other irrigation monitoring systems send SMS messages to nominated numbers; however they lack any control over the water pumps and cannot turn them off. Subsequently, the water pumps continue to operate regardless of the fault at the pivot irrigators. These irrigation monitoring systems from Optic Communications continuously monitor the wireless link between the pivot and pump control units. This ensures the water pumps are shut down the moment an issue is detected. Furthermore, the wireless link employs 2-way communications between the pivot and pump to ensure all messages get through. The irrigation monitoring systems are protectd by a durable, waterproof, dustproof, UV stable case, which makes them perfect for use both inside and outside. The units do not require tuning or ongoing maintenance, and they operate from 12V or 24V DC or from optional solar power supply.